How to tell dinner from a hole in the ground. 1- The insulation theory: Get the rocks REALLY REALLY HOT, toss the pig in the hole and completely cover with leaves, dirt, etc, so that all the heat stays inside. You should be able to stand comfortably in bare feet on top of the pit because it's so well insulated. Pros: conserves energy. Cons: second-guessing is not an option. 2- The continuous combustion theory: Heat up the rocks. Lay in a pig. 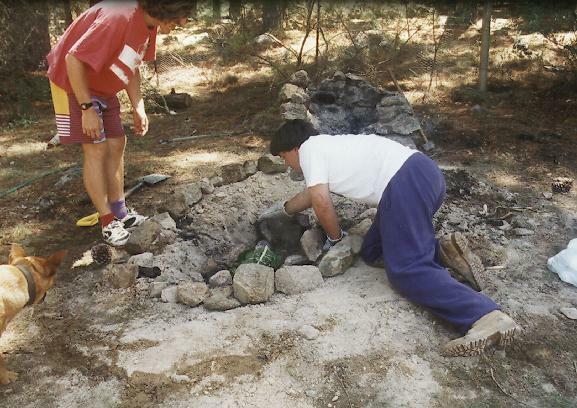 Lay in some more rocks, maybe a few leaves and embers, and then keep a fire burning over the top for the cooking period. Pros: You know it stays hot. You can probably even reach in with a meat thermometer when the fire burns down. Cons: this doesn't seem to be the traditional way. Traditional people usually know more about this kind of thing than people with "theories". We wanted to get to a 9pm film, so Pit 1 was a "quick pit". After a brief fire, one leg-o-lamb, some sweet potatoes and corn were placed in the pit with hot rocks and theory 2 (continuous combustion) was applied. After 3 hours the veggies were excellent, but the lamb was still a bit pink and got a some help from the indoor oven to finish. 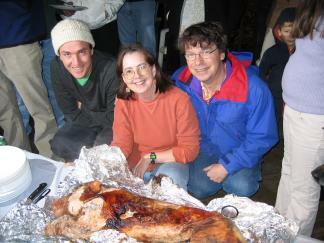 You searched for the WORD: pig roast  "ANU Library Catalogue"
TITLE        A dissertation upon roast pig. After pit 20 Paul Maragakis added this piece of folklore to our pit cooking knowledge: In Greece, kleftiko is a traditional way of cooking lamb in a pit (that was later trivialized to cooking in a pot or in foil). The art developed from habits of thieves (kleftes) in the mountains of Crete. The thieves would prepare a hot pit before stealing the lamb or goat. Once the animal was taken, it was quickly buried in the pit. The unlucky owners of the animal could not locate the roast because of the lack of smoke during cooking. The lucky thieves would have a feast once the fuss settled down and the lamb cooked to perfection. Pit 2: clearly another test was needed before attempting a pig. 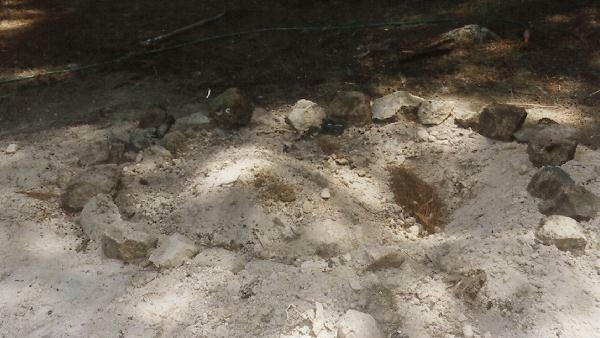 We enlarged the pit and ringed it with rocks. The second fire was stoked and burned for two hours. 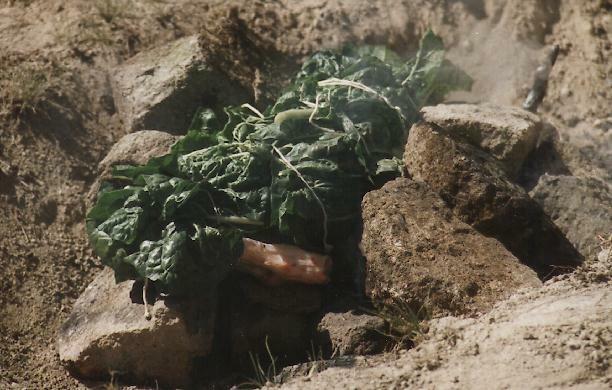 With a hot rock inside, a turkey was wrapped in silver beet leaves (no banana leaves could be obtained). The turkey was placed in the hot rocks, covered with pine needle insulation, and buried for 8 hours with sweet potatoes, corn, parsnips and potatoes and theory 1 (insulation) was employed. This was a great success. The turkey was cooked to perfection, falling off the bone, but still moist and juicy. Vegetables had about an 80% retrieval success. On to the pig! Warning We switched to video technology for recording Pit 3, MPEG movies may be a bit large and slow to retrieve. Pit 3 The Pig: A pig weighing 13kg was prepared by rubbing it with mango and placing some onions and spices in the interior [MPEG]. The pig must have had a run in with Mr. Blonde, since it only had one ear. 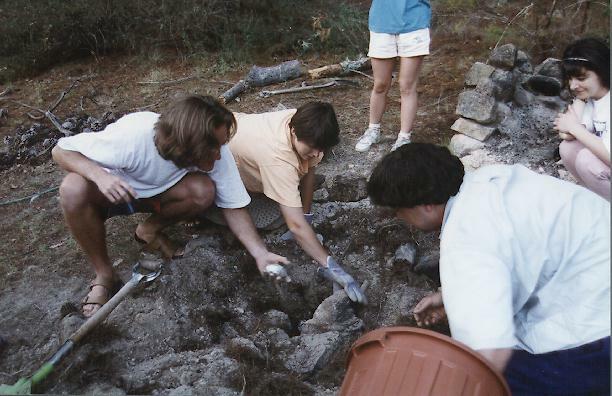 A really big fire was built in the pit, and we heated granite rocks in it for 3 hours. We took three really hot rocks from the fire and stuck them in the pig then wrapped it tightly with banana leaves [MPEG]. Putting the hot rocks inside the pig is really cool. Lots of smoke and sizzling sounds. Sort of like a giant "sizzling pork" dish at Full House. 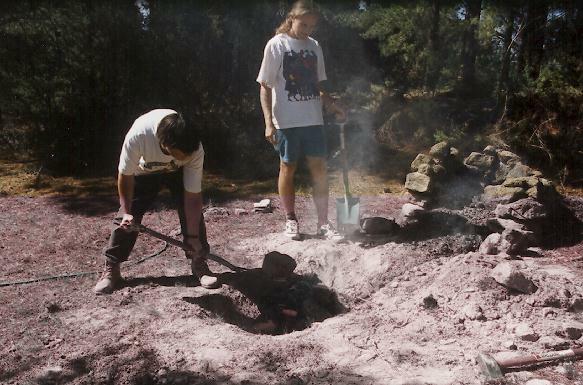 Next the wrapped pig was placed in the pit with hot rocks and embers. 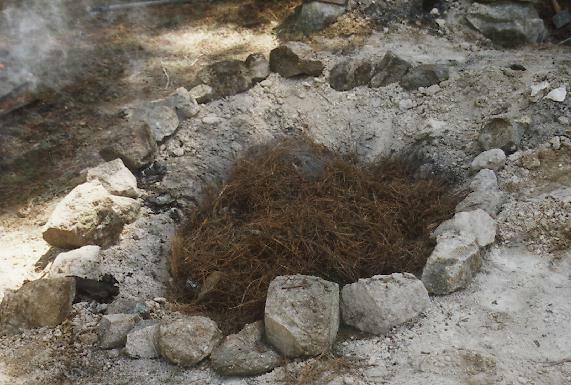 A layer of grape vines, then pine needles was used to insulate the pit and you can see the steam coming up through the pine needles from the hot rock oven underneath [MPEG]. The whole thing was covered with dirt and cooked for 11 hours. [MPEG]. Around hour 8 we uncovered it to add vegetables. The pig appeared done at this point, but we covered it back up anyway. c) put the veggies in at the beginning, but on top of a layer of insulation. 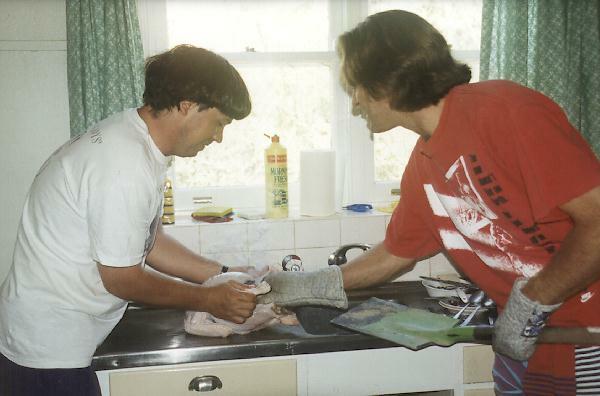 There were two extremely memorable parts: when the cooked pig was on the kitchen table, we were moving it around to try to make more space. As we moved the body, the head stuck over edge of the table....PLONK!! (sounds of screaming) pig head on floor, one grad student in need of sedatives. Joy of Cooking forgot to mention: "The roast is done when the head falls off under its own gravity." The second "moment" came a few minutes later. Some dirt had gotten through the leaves and we were trying to figure out how to clean it. Lynn had the great idea to use the vacuum cleaner. But the highlight was when the tail got ripped from the body and sucked into the vacuum cleaner. Otherwise it was a perfectly normal meal for about 16 people. Team Mumu moved on to the "two pit theory", one 12 hour pit sufficient to cook a 20kg lamb, and one 6 hour pit for the 30kg of vegetables. This worked exceptionally well, and both lamb and vegetables were done when the guests arrived. For additional variety, a stuffed chicken was placed inside the lamb. Banana leaves are traditional, but aluminum foil seals out dirt better. We now wrap all our meat in heavy duty al foil and a wet cotton sheet. 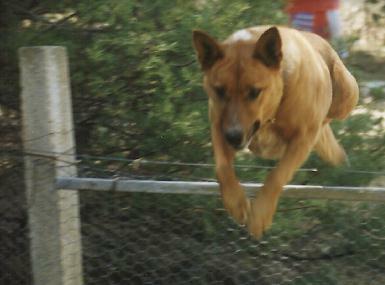 Chicken wire is the key to retrieving a large, hot cooked animal from the ground. Otherwise, the meat tends to fall apart and be difficult to handle. We've given up on the hot rock inside of the meat in favor of better wrapping to seal out dirt. An excellent spice mix to rub inside a pig includes: salt, cinnamon, coriander, and cumin, plus several whole apples. Overcooking has never been a problem. Use of a remote temperature sensor inside pit 19 indicated that the pig was done after approximately 4 hours. We left it for the full 8 hours scheduled (the party wasn't ready to start early). Fortunately, the mumu style of cooking keeps the meat moist and tender no matter how long we have left it buried. A 30lb pig cooked for just under 6 hours was done to perfection.